KINGDOM HEARTS 358/2 Days Vol.3 Manga Cover Revealed! 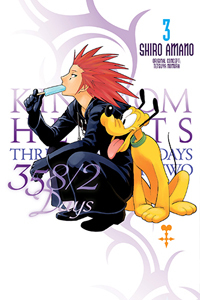 Next up in Yen Press's release of the Kingdom Hearts 358/2 Days manga is the third in the five volume series, releasing in March 2014. The cover art sports a certain Flurry of Dancing Flames with a deliciously salty and sweet dessert in hand and an all too familiar canine, which you can view below. Roxas's days as a member of the infamous Organization XIII continue steadily onward as friendships rise and fall and mysteries begin to unravel. It won't be much longer until those 358 days come to a close, so be sure to pick up the rest of the KINGDOM HEARTS manga series from your local bookstore or online. And to make sure the full story is revealed, don't forget to let Yen Press know you want to see the novels translated! Thanks to forum member Antiquity for the heads up! Yes! I am so excited! Goodness, this reminds me I should really update my Kingdom Hearts manga library. I had all the recent volumes until it was dropped and I had to scavenge for translations online. So this makes be thrilled to bits! I wonder when they'll announce the next KH manga release, which is most likely another Days-volume. Possibly once Vol. 2 is out? Have any of you on KH Insider heard any news about the KH 2 Manga Vol 3 as it says at the end to be continued in Vol 3, yet they haven't made much announcement. Is it cause maybe the KH2 manga is still being worked on and they need to wait for more? Plus does anyone have any idea how many volumes have been printed from the original ones into the 2 new big ones? Hasn't KH2 manga reached its seventh volume, though? It was released last month, on the 22nd of November to be more precise. Not to fond of this cover. I agree. I like Pluto but I find the past 2 ones of Roxas and Xion beat this one by far...Axel looks odd to me, IDK. Seriously though, Pluto, with a hankering for ice cream, and Axel keeping a suspicious eye on him. Adorable. Gj, Amano. Gj. I like it. There is Axel, the jovial villain on the cusp of becoming the tragic anti-hero, pondering his existence. Then there is Pluto, with his doggy soul, who just wants some ice cream. Agreed the past ones were better. Its Axel, not sure why though. Personally, I'm not 100% sure why, but I get the feeling it's because of Axel's face being odd. He look very odd mid-sucking on that sea salt ice cream <_< It's not a very "flattering" pose for him. I like Axel's pose. It's really casual and it makes him look a bit like a ruffian who is about to tag a wall, keeping it cool with some ice cream while keeping an eye out for somebody who will rat him out or something. It reminds me of his teenage self in BBS, and with Pluto there it just makes the whole thing adorable. I think Axel is just being nonchalant here, which kind of appeals to me. It makes him appear more human and relatable; you know, as in, he's just a guy chilling out with a dog while eating ice cream, not unlike some of us would sometimes do during days of a blazing sun.